Happy Valentine’s to you all. Using an electric mixer, beat together the cream cheese and butter until light and fluffy. Add vanilla and beat just to combine. Add sifted powdered sugar and beat until smooth. Place mixture in a piping bag fitted with a large plain round tip. Pipe cream cheese “kisses” onto the top of each muffin. I hope your Valentine’s Day is as sweet as these are. I’ve been on quite a blogging break, I believe last time I posted I was planning my wedding. Now I’ve been married for more than a year and we recently welcomed our first child, a sweet baby boy. I’ve been cooking and baking all along, just didn’t take the time to post. My goal this year is to get back into posting. We are named Two Girls Cooking after all, it’s not fair that one girl’s been carrying the blog by herself! I have been on leave at work and I decided I wanted to bake a sweet treat before I go back later this week. I bookmarked these Snicker’s cupcakes a while ago, I’ve been meaning to make them ever since. There have been a couple times I had the mini snickers on hand, but they never lasted long enough to be made into cupcakes! These were very simple and fun to make. I liked that they use a boxed cake mix, but dress it up a bit. I also loved the fun surprise of having the snickers baked into the center. I even got to use the big icing tip that Patricia gave me as a birthday gift to try to make them look as good as they do on My Baking Addiction. They aren’t quite as pretty, but I’m still proud of how they turned out. I’m not usually a big fan of a lot of frosting, and while this is rich, I’m really enjoying the carmel buttercream. I think I can probably find some other recipes that it would work well with too! 2. Line (2) 12 cup muffin tins with paper liners. 3. In a large bowl, mix together the cake and pudding mixes, sour cream, oil, beaten eggs, vanilla and water. 4. Evenly divide the batter amongst the prepared pans. 6. Bake for 18-22 minutes, or until top is springy to the touch and a wooden toothpick inserted comes out clean. 1. Cream the butter and shortening in the bowl of an electric or stand mixer. Add the vanilla extract, salt and caramel syrup and combine well. Garnish with chopped Snickers bars and a drizzle of caramel of caramel syrup. Makes 24-30 cupcakes. I love strawberries, so when they go on sale I tend to lose my head and buy too many. This week I found myself with 4 lbs to use up. While I don’t mind just eating a handful as a snack, I wanted to get more creative to use them up before they go bad. 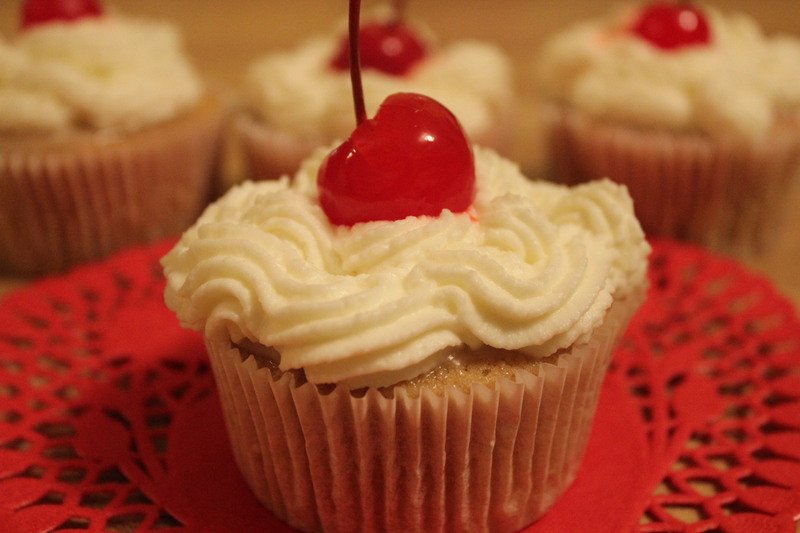 Today I found a recipe on one of my favorite blogs, My Baking Addiction, I just had to try. 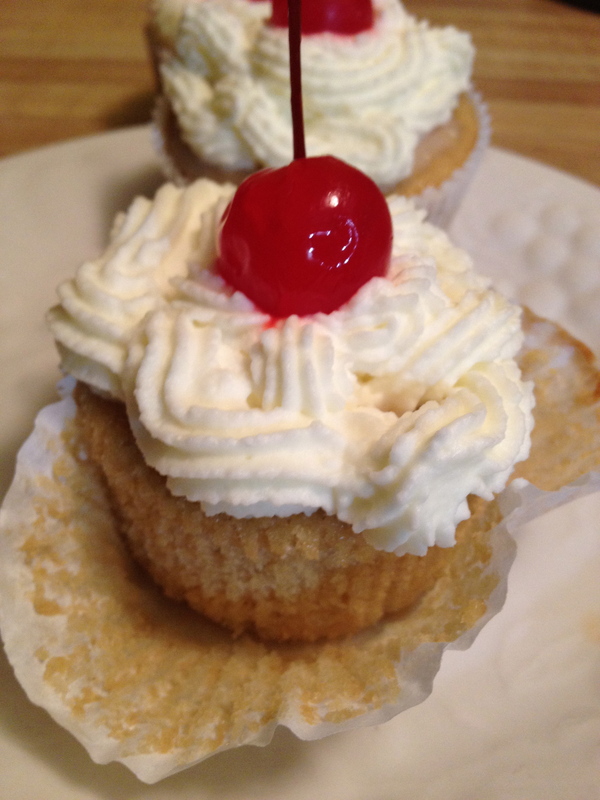 I decided to just use a box mix for these vanilla cupcakes to save time. Normally I’m not a big frosting person, I’ve never been the type that could just eat frosting out of the bowl. This frosting is so tasty, it might be the exception for me. It tastes almost like strawberry ice cream. 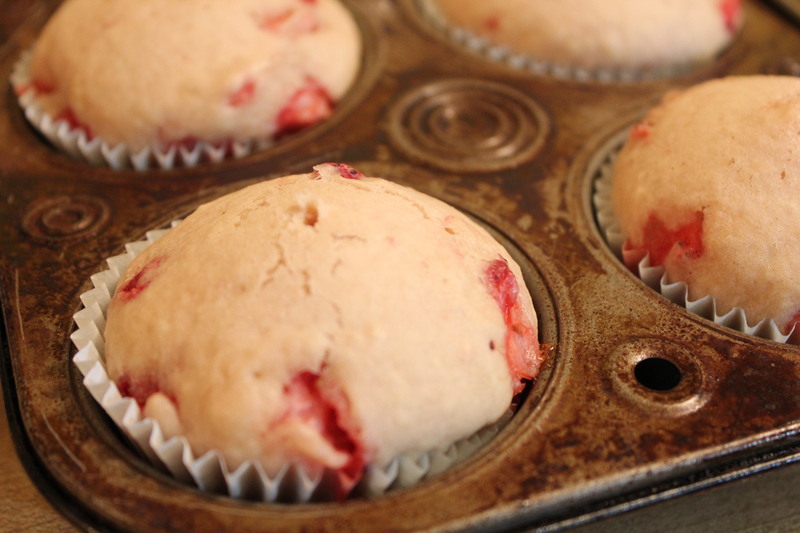 It is a bit soft, but keeping the cupcakes in the fridge does the trick. Place strawberries in the bowl of a small food processor; process until pureed. In a medium bowl beat butter on medium speed until light and fluffy. Add in the cream cheese and beat until combined. Reduce mixer speed and slowly add confectioners’ sugar; beat until well combined. Add vanilla and 3 tablespoons strawberry puree (save any remaining strawberry puree for another use); mix until just blended. Do not over mix or frosting will incorporate too much air. P.S. 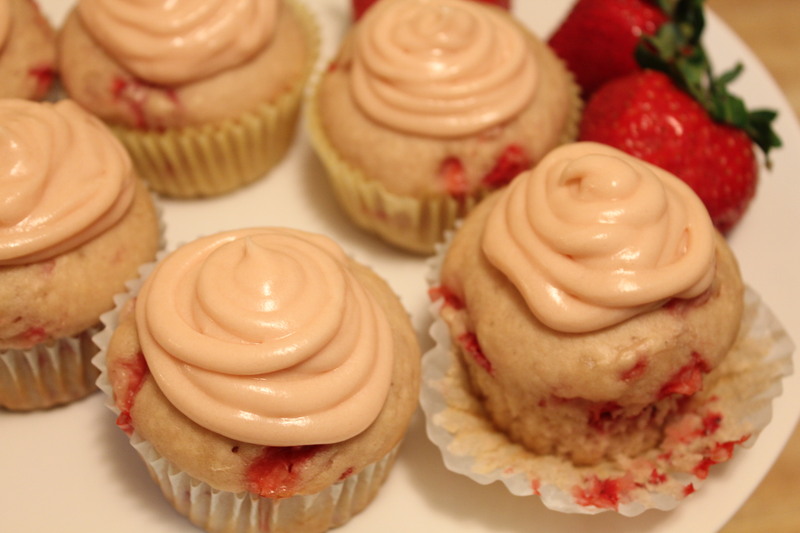 What’s your favorite way to use Strawberries?